Freedom of the press protects the right to obtain and publish information or opinions without government censorship or fear of punishment, whether or not government finds the material offensive, or disagrees with it. Free speech enables people to obtain information from a diversity of sources, make decisions, and communicate those decisions to the government. Recently I wrote about having my press credential renewal denied by the Capitol Correspondents Association of California, appointed as an arm of the California Legislature’s Joint Rules Committee, which has the final say in press credentialing Capitol media. What began as a witch-hunt several years ago by the totalitarian bullies who make up the righteous Capitol media cartel, who assumed the role as arbiters of fairness and free speech, turned into a valuable schooling in First Amendment rights. Following a Legislative Open Records Act request submitted by the Pacific Legal Foundation, my attorney Paul Beard, with ALSTON & BIRD LLP, filed an administrative appeal, which we just won. I picked up my Capitol Press Credential a few days ago. The ensuing process exposed the air of supremacy and inability for self-reflection among California’s liberal media and mainstream journalists, who view themselves as unimpeachable and above reproach. 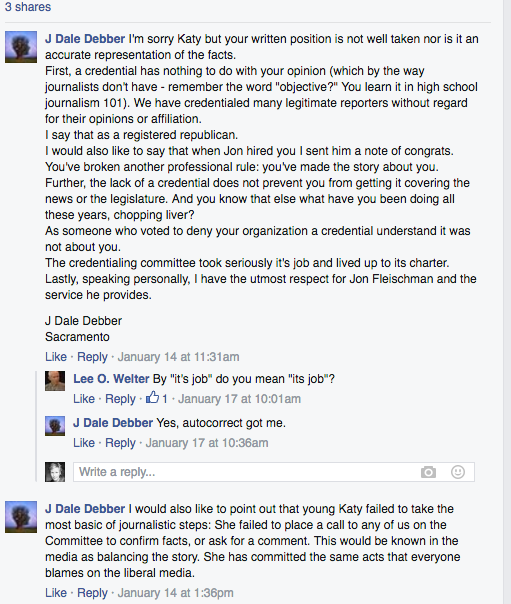 J Dale Debber “I’m sorry Katy but your written position is notwell [sic] taken nor is it an accurate representation of the facts. First, a credential has nothing to do with your opinion (which by the way journalists don’t have – remember the word “objective?” You learn it in high school journalism 101). We have credentialed many legitimate reporters without regard for their opinions or affiliation. I say that as a registered republican. I would also like to say that when Jon hired you I sent him a note of congrats. You’ve broken another professional rule: you’ve made the story about you. Further, the lack of a credential does not prevent you from getting it covering the news or the legislature. And you know that else what have you been doing all these years, chopping liver? As someone who voted to deny your organization a credential understand it was not about you. The credentialing committee took seriously it’s [sic] job and lived up to its charter. Lastly, speaking personally, I have the utmost respect for Jon Fleischman and the service he provides. 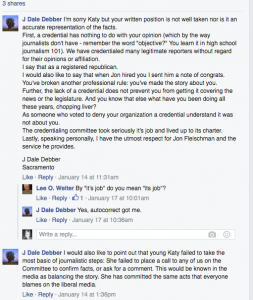 J Dale Debber: I would also like to point out that young Katy failed to take the most basic of journalistic steps: She failed to place a call to any of us on the Committee to confirm facts, or ask for a comment. This would be known in the media as balancing the story. She has committed the same acts that everyone blames on the liberal media. I replied to Mr. Debber that I had been in regular contact with CCAC board president Jim Miller during the credential process, and got my facts directly from him. This wasn’t my first dance with the Correspondents Association; each year at press credential renewal time, I experienced delays and hassles with my credentials. One year the Assembly Speaker’s office even took away the press desk assigned to me by the Assembly Minority Leader, and reassigned it to a news outlet that no longer had a Capitol correspondent, and directed me to the “Visiting Media” desk in the farthest corner. “The constitutional problem with the Association’s decision is that this same policy is not consistently (if ever) applied to Ms. Grimes, who produces hundreds of news articles every year covering the Legislature, and she does so by being at the Capitol, attending committee hearings, press conferences, meeting with and interviewing lawmakers, staff, lobbyists, and members of the public,” Attorney Paul J. Beard wrote in the appeal to the Joint Rules Committee. The records that were helpful to winning the administrative appeal, obtained through a Legislative Open Records Act request submitted by Pacific Legal Foundation, requested the last 10 years of press credential applications, approvals and denials. 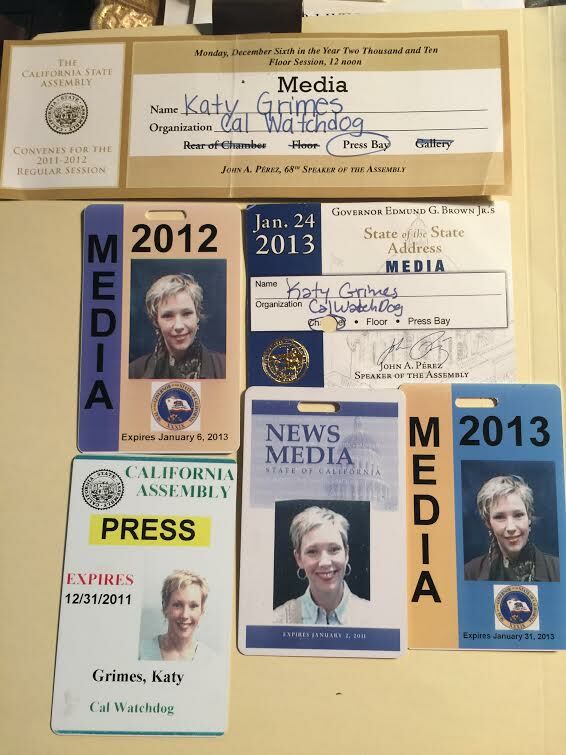 In the 10 years of records received, there were no denials of press credentials… until now. The Adelante Media Group, which also had numerous state Capitol press credentials, is a Latin based music radio station group with stations in California, Idaho, Washington, Utah and Wisconsin, had press credentials. 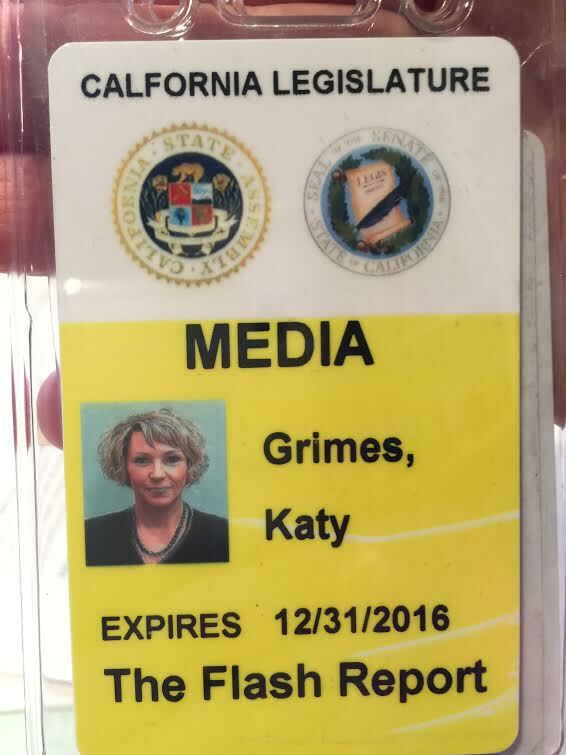 Capitol Public Radio even had a photographer who received State Capitol press credentials. The CalChamber was issued Press Credentials for a guy who was also employed by McNally Temple Associates, a political public relations firm that also handles political candidates. In 2011, the “Office Manager” for the Los Angeles Times received press credentials. NHK Japan Broadcasting (in Japan) is granted press credentials. 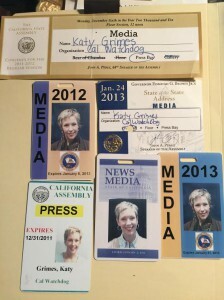 Cal-OSHA Reporter is granted press credentials. Workers Comp Executive is granted press credentials. Both are under the umbrella of Providence Publications, run by the aforementioned J. Dale Debber, a CCAC board member. They also publish the Workers Comp Resource Guide, and Compline, which provides access to workers comp providers and services. The best check against abuses by government officials, as well as those by the media, is to uphold freedom of speech and freedom of the press for those who choose to exercise these rights. The First Amendment doesn’t just apply to elitist liberal media and mainstream journalists, even though they appear to think it does. This entry was posted on Wednesday, May 4th, 2016 at 6:46 am and is filed under Blog Posts.